I'm not sure why I didn't write this post sooner. Well, better late than never, right? Warning, it's fairly wordy, so beware! 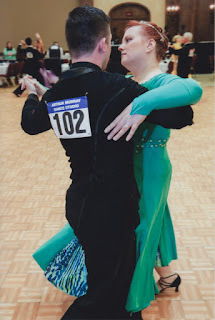 The dress (I nicknamed it "Modern Nature" after the song I used for the solo I made it for) as it is shown in part 3 of this series is the version I wore to the Seattle Dance-O-Rama (DOR) in 2014. 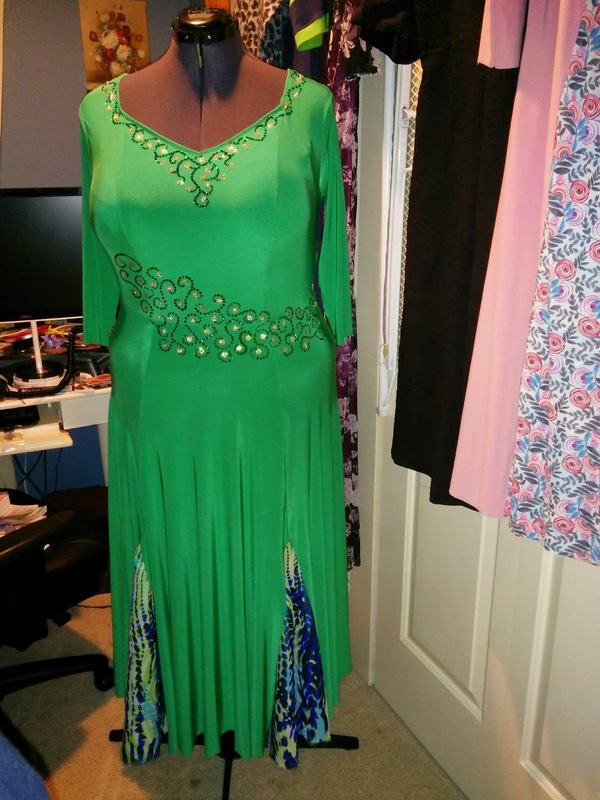 After DOR, my dress more or less sat for several months untouched. 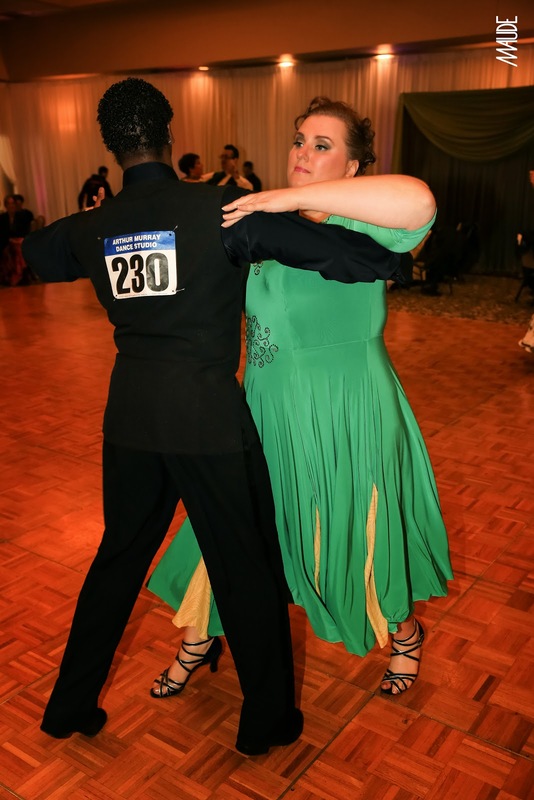 Then, in early 2015, I had a Quickstep routine that I planned on performing, so I decided to do some improvements to my dress. I never really liked the yellow fabric I used for the skirt godets. It was thin and had glitter on it and it stuck to itself as well as the green ITY fabric of the body and was just generally very annoying. But it had been a last minute choice from JoAnn's where there weren't a lot of options that I liked and I didn't have the time to look around. So, I literally cut them out. Since then I had been ordering some various fabrics from Fabric Mart and Fashion Fabrics Club that I thought might be nice for a future ballroom gown. 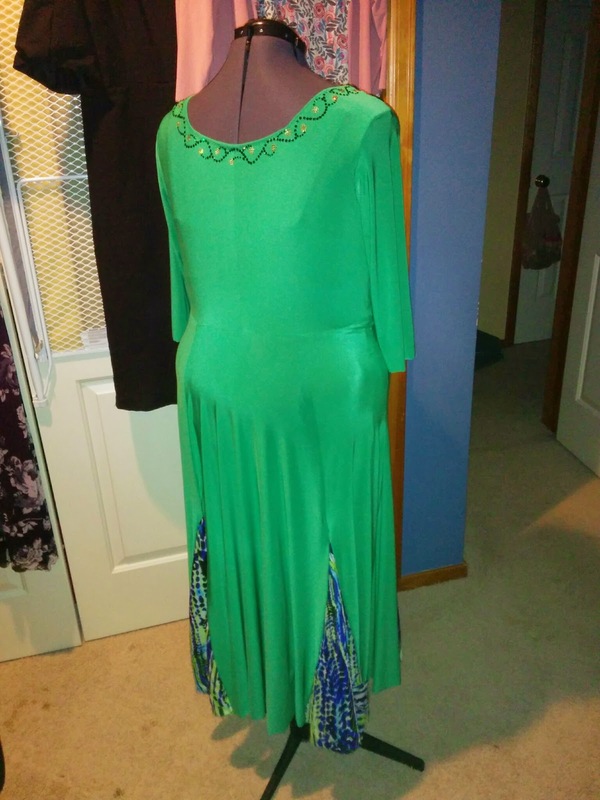 So I had some "Cobalt/Lime Animal Stripe Chiffon" in my stash that I thought looked nice with the green fabric of the main dress. The chiffon was too chiffony to work well by itself. 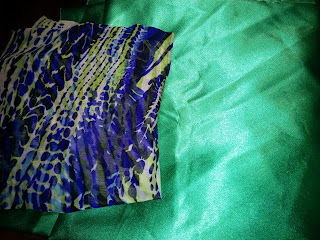 I happened to have some green crepe back satin from JoAnn's in my stash as well. 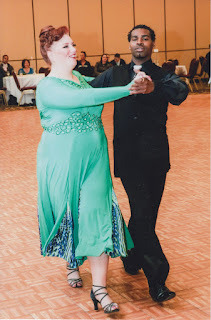 When I layered that under the chiffon, it was so pretty; the shine of the satin really came through and gave the chiffon some dimension (and stability) that it didn't have alone. I used a regular glue stick to baste the chiffon to the satin to keep it from shifting around while I cut it. I cut new godets a bit bigger this time around and attached them in the seams that previously had the yellow ones. I then glued more rhinestones until I had a sort of blobby belt going around my waist. I'm not super happy with how they show up from a distance, but live and learn, right? The skirt flares out from pretty much my waist and it should be closer to my body down through my hips. The panels in the center front and center back look too wide without godets in them. The sleeve length is odd. So, I went home and took each seam in quite a bit for several inches below the waist and cut the front and back panels in the center to add godets. That helped fix the first two problems. Another problem that I already knew about from when I wore my dress at DOR was that after I danced several heats in a row, I would start to sweat and the sweat started to show through the dress, starting with under my arms, but only on the sleeve, not the bodice. The bodice of the dress has two layers of the green ITY and a swimsuit lining, so it's three layers, but the sleeves were only a single layer of the green ITY, so there wasn't anything to soak up the perspiration other than the outer fabric. This is something I definitely need to account for in my future dance dresses. So, I removed the sleeves completely and cut the sleeve out of the swimsuit lining to the length I wanted them to be so that I would have lined sleeves. Unfortunately, I didn't have enough of the green fabric to recut the sleeves. 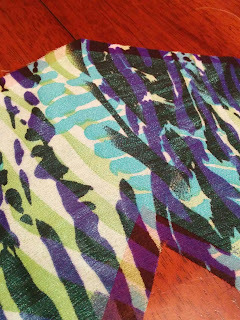 I experimented with the idea of trying to put a stripe of the chiffon + satin fabric across my forearm to make the seaming there look more intentional and to also tie that fabric in to the upper part of the dress, but I couldn't figure out how to make a woven and knit work together the way I pictured it in my head. Instead I just sewed on the amount of green to make them into long sleeves ending with a point. I find that in my videos I don't notice the seam across my forearm. Some photos of me in the backyard. Here are some in-action photos from the Banff DOR I participated in back in April 2015. Watching these videos, I still think I could take the side seams in a bit. But I think I've lost some weight since last year too, so I've been thinking I might more or less scrap this dress. If I did, I figured I could cut out the fabric around the rhinestones into interesting shapes and use those as appliques on a future dress. I do enjoy the style of dresses that have more dimension than this one does, so I'd like to incorporate that into the future. 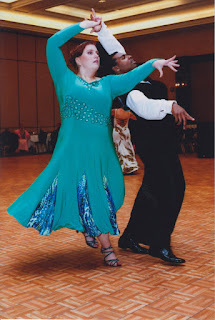 I still have the pattern I drafted to make this dress, but at this point, I've made so many alterations here and there over the years that I didn't notate, that I think it might be easier to just start the entire drafting process over again for my next dress. Next on the agenda is to put together a rhythm dress, hopefully before I go to the Portland DOR at the end of April.